Located in Kitchener, Pioneer Transmission is a trusted part of the community for over 31 years. Locally owned and operated, this all-Canadian company is proud to serve your automotive transmission and drive- line needs. Our professional automotive technicians use up to date technology, in their no-charge diagnosis of your situation. Our work is warranted and recognized across North America. 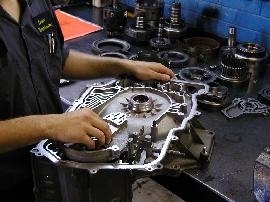 We are the original PIONEER TRANSMISSIONS, keeping Southern Ontario in gear since 1984. Call us today to schedule service at our garage.